Bangkok Real Property helps finding and securing condos, houses, apartments and commercial property for rental purposes in Bangkok. Help setting up your utilities such as Internet, cable TV, Drinking water services and a maid if you need one. A bright, modern, 2 Bedroom condo is available for sale at Abstracts Sukhumvit 66 / ideally located off Sukhumvit 66/1 and just 5 minutes walk (380 metres) from BTS Udomsuk. This modern low rise development by BTS Assets just built in just 2011 and offers residents easy access to Sukhumvit’s amenities including Piyarom Place, Tops Market, Udomsuk Fresh Market, Central Bangna, IKEA / Mega Bangna, Paradise Park several international schools including Wells International and Suan Luang Rama 9 Park. 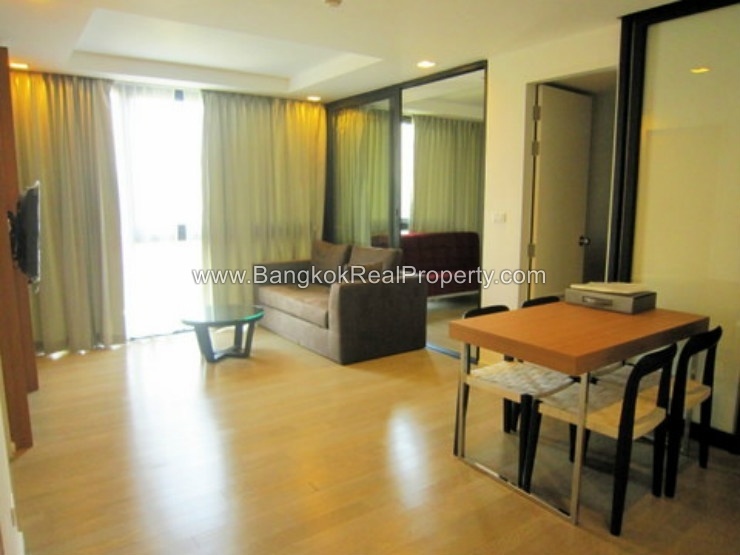 Situated on a mid floor of Abstracts Sukhumvit 66 /1 this modern unit has 2 bedrooms, 1 bathroom and 49.31 sq.m of living space with a balcony. The unit is fully furnished with LCD TV, separate kitchen equipped with electric hob & extractor, fridge-freezer, microwave and washing machine. Master bedroom has a built-in closet and nice bathroom with power shower. The 2nd bedroom is suitable to make a study or guest bedroom. Land Department Taxes & Transfers paid 50/50 by the seller & the buyer. (+66) 089-412-0111/ (+66) 094-343-7994- 7 Days a Week ! ** Note: Bangkok Real Property cannot guarantee the immediate availability of the properties on our website as the Bangkok market moves so rapidly. Please contact us for up-to-date availability of our listed properties. Abstracts Sukhumvit 66/1 is a condominium project, located in in Outer Sukhumvit at Udomsuk just 5 minutes walk from the BTS. Developed by BTS Assets, Abstracts Sukhumvit 66/1 was completed in 2011 and this low rise project comprises of a 2 buildings each with 5 floors and a total of 56 units. Don and Tom are extremely accommodating where nothing is too much trouble. They began helping us while we were still in the UK and made the transition smooth and simple. Both Don and Tom speak excellent English and, alongside their local knowledge, make the logistics of, potentially a very stressful time, simple and reassuring. The “after contract agreement” care is also extremely helpful and responsive. We have only had a few minor ‘Teething Problems’ since we moved in which, thanks to both, has been rectified within 24 hrs .... mostly even sooner. Basically, these guys are great, and I highly recommend their services ? Tom is highly professional and extremely helpful in all aspects of finding a condo and organising utilities. He showed me several properties which matched what I had asked for. He has continued to offer support and help with any question I have had whilst living in my condo. I would highly recommend Bangkok Real Property. Don and Tom made my move into my apartment so simple. They worked with the landlord to draft the contract and I only had to spend around 30 minutes with them when I collected the keys. They are both great at replying to messages on Line and working with my landlord to fix issues quickly- I had a small issue in my bathroom that was sorted really fast. I would ask for their help again in the future if I move. Did an absolutely amazing Job all around. Managed to move me in on the day I saw the unit I wanted. Super pleasant gentlemen, highly recommend! Tom and Don are super friendly and helpful in helping me to find the most suitable accommodation. Always available and supportive! Highly recommended. Don and Tom were amazing and continue to be so. I wanted to wait to write a review until we had lived in our place for a while and I couldn't be happier. They continue to help us anytime we need assistance with no questions asked. We were able to get a place better than we had even hoped and everything that we ask happens so fast! Thank you! After four years, I had decided to move out of downtown Bangkok and closer to work, but I was a bit nervous about moving away from all the action and finding a place I liked as much as my current condo. As it turns out, I needn't have worried! The first house Don and Tom showed me in my new neighborhood was exactly what I was looking for. All paperwork and details were efficiently taken care of, and all my questions were answered swiftly and thoroughly. On top of that, they were especially helpful in communicating with my landlord, setting up my internet installation, and, to this day, continue to assist with any issue that comes up around the house. No matter where in Bangkok you're searching for your next home, I highly recommend contacting Don and Tom. They are prompt, flexible, encouraging, and genuinely helpful agents. Huge thanks to both of you! Tom and Don have been really helpful and couldn't have made the move easier. They have been easily contactable and quick to address any issues, and have gone above and beyond to make sure I am settled in my new place and to help me get to know the area. I would definitely recommend and wouldn't hesitate to use their services again! I had been looking for a place to move with some rather specific specifications and a short time frame. Don and Tom were incredibly helpful and not only showed me exactly what I was looking for, but also some other ideas and properties as well. The best part for me, was that both of them are incredibly real. They didn't push me to make a quick decision, but encouraged me to take my time and make sure I was choosing the best option for me and my future living space. Even after moving in, they've been incredibly helpful in contacting me to see how things are going and have helped me out with various resources and fixes that I've been finding along the way. I would absolutely 100% recommend Don and Tom as your future agents as they are not only professional in the way they handle their business, but also truly work towards what's in your best interests to make sure you are happy.